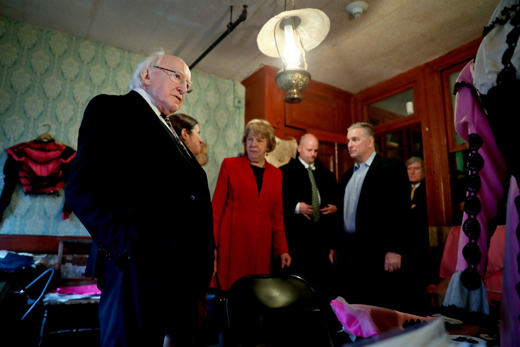 President of Ireland Michael D. Higgins and his wife, Sabina, visited New York in late April. The trip saw him address the United Nations General Assembly and meet with senior international officials, as well as pay visits to several of the city’s Irish cultural institutions, including the Irish Arts Center and Ireland Funds. During his U.N. address, Higgins discussed the shame of how, in the 21st century, nations are creating situations that harm civilians more than ever, asking, “is it not nothing less than a moral outrage that our boundless capacity for creativity and innovation, and the fruits of new science and technology, are turned, not to the promotion and preservation of peace, but to the pursuit and prosecution of war?” He also reflected on the Good Friday Agreement, which U.N. President Miroslav Lajčák identified as “essential for successful peacebuilding” and reiterated his support for the U.N.’s founding principles. President Higgins also tackled the issue of women’s rights at the Ireland Funds’ Women in Leadership Series, where he spoke about Ireland’s failure to acknowledge women’s voices, noting the “false dawn” of Countess Markievicz’s election as a cabinet minister in 1919. Though she was the first democratically-elected female minister anywhere in the world, it would be another six decades for Ireland to elect a second. “For too long during our 100 years as an independent Irish State, the voice of women in Irish political life was marginalized, ignored, or silenced,” he said. In reference to the United States, he also expressed his concern about the current gender climate. President Higgins mentions Countess Markievicz becoming a member of the Irish cabinet in 1919, and goes on to talk about “…our hundred years as an independent Irish State…:.The government in which Countess Marjievicz held a cabinet position represented the whole Irish nation and all its parts, and her party was Sinn Féin. But higgins’ ,state encompasses only 5/6 of the Irish nation and fiercely opposes the Sinn Féin Party.